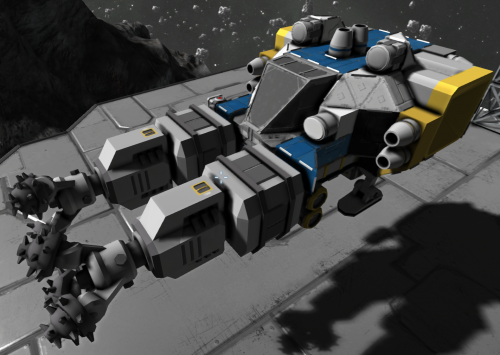 The Miner is a small pre-fabricated utility ship found on Easy Start 1. It's a fairly basic light mining drill ship with two ship mounted Drills, a Spotlight, Ore Detector and fully oxygenated cockpit with on board Oxygen Generator. The ship lacks a few key features such Landing Gear, no way to store oxygen beyond the cockpit, has no antenna or beacon, rather limited storage capacity and curiously for a mining ship has no Collectors which would be extremely ideal for any stray ore that the drills do not capture. 2 Drills connected via small conveyor to storage. An oxygenated Cockpit located in between the two drills. 4 Small Reactors providing 2.0 MW and 1 Battery providing 4.32 MW of power, in total 6.32 MW of power at max load (and 1.08 MWh of charge). Medium Cargo Container acting as ore storage. 8 Small Thrusters: 2 forward, 1 backwards, 2 up, 1 down, 1 left and 1 right. Connector port at the back. This page was last modified on 3 May 2016, at 17:37.